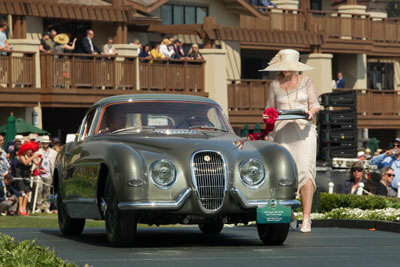 After a full nut and bolt restoration taking 6,725 hours by world-class specialists Classic Motor Cars (CMC), the wraps came off this unique Pininfarina bodied 1954 Jaguar XK120 SE yesterday at the Pebble Beach Concours d’Elegance in California, USA. He added: “The car was admired all day and we are delighted to be bringing a trophy home as a further testimony to the skills, dedication and attention to detail that we have in our business." This XK120 features unique bodywork by famed Italian coachbuilder and design house Pininfarina. It was first delivered to a Mr Max Hoffman in 1954, who was an Austrian-born, New York-based importer of luxury European automobiles into the United States during the 1950s. He was a petrol-head who inspired the production and refinement of several vehicles from the main manufacturers, which earned him entry into the Automotive Hall of Fame in 2003. It is believed that Hoffman inspired Pininfarina to reinterpret the shapes of the XK and then unveiled it at the 1955 Geneva Motor Show. 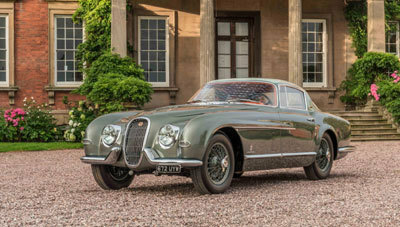 After the unveiling in Geneva, the XK appeared at the Autocar Show later in April that year and Australian magazine Modern Motor reported that it was due to be exhibited at the Turin Motor Show in 1956, but never arrived due to the owner wanting to take delivery of it. In 2015, CMC purchased the car from a German gentleman who bought it in the USA in 1978 with the intention of restoring it. Unfortunately, he never got round to it and eventually decided to sell. CMC took on the challenge and have restored every nut and bolt of the vehicle. The team of specialists faced a number of challenges during the restoration, from finding the original paint colour to remaking the bumpers and rear window screen. Barzilay said: “Some of the original parts were impossible to find so we had to remake items such as the bumpers and chrome work by hand from photographs. We had to scan the front and rear end of the car and make mock ups of the lights, which were then scanned and 3D printed. Smaller missing parts were also 3D printed in-house. During the pre-restoration inspection it was found that Pininfarina had used the original XK body as a basis, and that, at some point in its life, the car was painted Burgundy and had the seats covered with tan leather.